Whenever I'm asked why I trap sparrows, I answer for the same reason why I set rat traps - to eventually dispose them. Some say pigeons are the rats of the sky. To me, that's an insult to pigeons. Sparrows are the rats of the sky. They're pests. And there's just too many of them. If I could only safely use an airgun to kill them I would. I live in a rather urbanized area in the city and it would be probably illegal to use airguns. I think sparrows build their nests wherever they want. I've found a sparrow nest with eggs before. I'd hear them noisily rapping and pecking in the roof gutters and have seen a nest built by them. Blocked roof gutters and drain pipes because of the nest materials may cause considerable water damage. 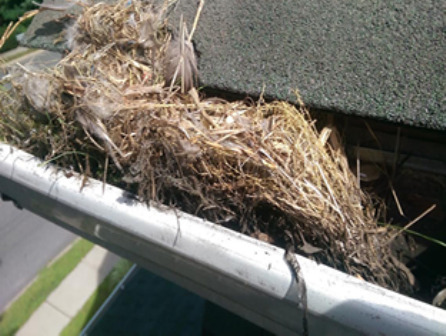 For this reason, you need to continually check the roof gutter and pipes and remove debris from sparrow nests. Sparrows leave their poop on the hood and roof of the car. Our garage isn't enclosed on all four sides and sparrows are the only birds that fly through the inside of the garage. 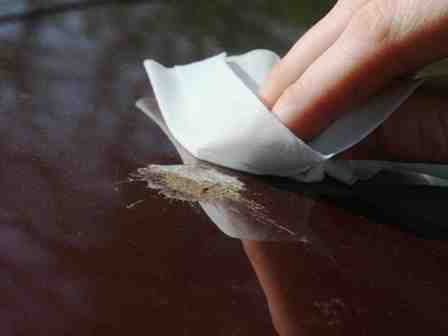 Sparrow droppings are highly corrosive and can cause considerable damage to both buildings and vehicles. The acidic nature of sparrow droppings damages car finishes, gutters and other metal structures on buildings. Sparrows, like some other bird species have a behavior called dust-bathing. When you see a sparrow flapping frantically in the dirt, you may at first be startled or alarmed, but the bird is simply taking a dust bath and is not in distress in any way. The sparrow begins by scraping their feet in dry, fine, crumbly dirt or sand to create a wallow. Lowering the breast to the ground and rolling or rocking may deepen the depression, and the sparrow will flip its wings vigorously, similar to bathing in water, to spread dust over the entire body. During this frantic motion, the feathers may be fluffed and the tail spread so the dust can reach the skin more easily, and the sparrow may rub its head to the ground as well to coat the shorter feathers on the cheeks. The big problem is these sparrows dust bathe in the soil of our hanging potted plants. And it is only the sparrows which display this behavior. The above photo shows the result of that activity. Notice how the soil has been practically dug up exposing the roots of the plant inside the hanging pot. Some plants start to tilt to the side due to the loss of soil. Some sparrows are aggressive enough to even toss out the mulch on the soil. The above photo also shows a dislodged homemade plant label. Sparrows could dig and burrow deep enough that they sometimes dislodge the plant labels and even toss them out of the plant baskets. When you have different types of bougainvillea plants (like I do) in hanging garden baskets, you want to identify and label them with plant markers. That's the importance of these plant tags, markers or labels. But when you see several dislodged plant markers or labels on the ground, it's a nightmare to put them back into the correct individual hanging baskets again.